If you’re a roulette player, you’re bound to find no zero roulette a pure joy. That’s because the house edge in European roulette, which is 2.63%, and the edge in the American game, which is double at 5.26%, is eliminated in the no zero game. Of the two well-known versions of this favorite table game, European roulette, which features the single zero, clearly has the lower house edge. American roulette, which is the least favored amongst players, offers a zero and a double zero. It is the zeros that make roulette bets a lot harder to win. For those players out there looking for the best place to enjoy a game of no zero roulette, Slots.lv Casino should be your go to online destination. A brilliant provider of top quality gambling games and our top pick. 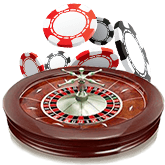 Why Play No Zero Roulette Online? At first, many players don’t understand how much they can benefit from no zero roulette. But when it’s explained that on single number bets both American and European versions pay only 35-1 despite the fact that their true odds are 38-1 (numbers 1-36 plus zero and double zero) for American and 37-1 (numbers 1-36 plus zero) for European, it becomes clear that no zero roulette offers players an edge. The math being what it is players have more opportunity to win their wager with no zero, and if they hit a streak, it can result in major winnings. It’s interesting to note, that at this time very few online casinos or gambling sites offer no zero roulette. If you enjoy playing at land-based casinos, you will not find this game available. There are a few reasons as to why no zero roulette is fairly rare. The primary reason that it’s difficult to find is that it’s less profitable for casinos than the other versions. With European and American roulette players take on more risk. As an example, with zero and double zero games, you are less likely to win some of the low odds wagers such as the color bet. This is because color bets cover the black and red numbers and all zeros are green. Thus, it’s harder to hit that 1:1 odds wager. With no zero roulette your chances of hitting that bet are 50-50. That results in players having a much better chance of both breaking even, as well as realizing a profit. Online casinos that do not provide players with the chance to play no zero are protecting themselves and bolstering their profits. However, casinos can protect themselves with no zero by placing lower limits on maximum bets. Then why would a casino offer this type of roulette if it favors the player and reduces their profits? There is a gambling concept, which is known as the risk of ruin, that casinos count on to ensure that they make a profit. This works on a basic premise that all player bankrolls are finite. Consider that each player has a certain amount of cash with which they can gamble. Some will have more, while others will have less, but there’s always a finite amount. The person with less money will be unable to sustain their action for as long as someone who has more. Thus, there’s a better chance that the short-stacked player will leave their money at the roulette wheel. A player’s risk is partly dependent on how large their bankroll is and how much they wager on each turn of the wheel. That means that a gambler with a bankroll totally $200 who is making $40 bets has a greater possibility of losing their bank more quickly than someone with $2,000 making $10 wagers. That former bettor’s risk of ruin is much bigger than the latter’s, and a casino can score a nice profit from that fact. Another factor that influences profits is the tendency of gamblers to be attracted to games that offer them a better chance to cash such as no zero. Plus, during each turn there will be many players betting single numbers, which are much harder to hit. With each spin of the roulette wheel most, if not all, will lose those bets. If an online casino has no zero roulette, it is able to protect itself by setting lower limits on maximum wagers, attracting a large number of players, and banking on the risk of ruin. Playing no zero roulette does provide gamblers the best opportunity to win by wagering on a wheel that has only 36-numbers and not 37 or 38. Welcome to our page focusing on no zero roulette FAQs. Utilize this section to familiarize yourself with some common questions that bettors have about this innovative game, and use the answers provided to enrich your understanding of the game. Where can I play No Zero Roulette online? This version of roulette is only available through a select number of online casinos. To find an online casino that offers this new and exciting form of one the most popular table games around please see our pages dedicated to no zero roulette. We’ll be able to help find the right casino for you. No zero roulette has a slightly different table layout in that at the end of the number columns you will not find a zero or a double zero. Otherwise the table layout is the same, offering single number, column, row, odd/even, red/black, and other familiar roulette bets. The payouts are still the same, including 35-1 on a single number wager. How much should I bet on each spin? How much you spend on a spin is dependent upon a few factors. The first is the size of your bankroll and the second are the minimum and maximum bets allowed. A rule of thumb in bankroll management is that on any one turn you should bet between 5% and 10% of your bank that’s been set aside for that betting session. As an example, if you planned to risk up to $100 for a session at the roulette wheel and if you decide to spend 5% of your bank on any turn, you would make bets totaling no more than $5.00 on any one spin. You would then have a total of 20 spins available before you would either have to win or lose your bankroll. If you went with 10%, you’d wager $10 per spin and have 10 spins total before you would either have to win or your bankroll would be spent. The less you spend on a spin of the wheel the lower your risk on any given turn. Roulette wheels vary as to minimums and maximum bets per turn. Common minimums are $1, $5, or $10 per spin. Due to the fact that there is no house edge for no zero roulette, maximums are lower than they are for American or European roulette. Each online casino determines both maximum and minimum bets allowed. Does no zero roulette have good winning opportunities? One of the attractions of no zero roulette is that it does not have a house edge. European roulette with one zero has a house edge of 2.68, while American roulette, which includes a zero and a double zero, comes with a house edge of 5.26. Those edges translate into casinos keeping $2.68 of every $100 bet on European roulette and $5.26 of every $100 wagered on American. Plus, the addition of one zero and of the zero and double zero respectively are in no way reflected in the single number payouts, which are 35-1 on either 37 or 38 numbers. Eliminating those green zeros, gives players a much better chance of winning any and every type of roulette bet that they can make, but it is especially helpful for players who like to wager on outside bets, which offer less risk. Can I play on a mobile device or tablet? Most casinos provide access to no zero through their online website via their download version. However, some Internet-based casinos offer mobile and tablet access through APPs. If the casino provides no zero online, then there’s a good chance they will have the same version of this popular game available via a mobile device or tablet. Is there a live dealer version? No zero roulette is not available at any brick-and-mortar casino and it is not offered in an online live version at gambling sites. European, French, and American roulette are the types of roulette that may be played with a live dealer. Yes, online roulette is available in free play mode. Playing in the free mode allows gamblers to get used to the game and to adjust from having played European, French, or American roulette. Take some time to play no zero online for free prior to playing for real money. When playing in the free mode set a total bankroll limit for the session, play unit bets, and track your winnings and losses. This will give you a good idea of how solid your bankroll management skills are.